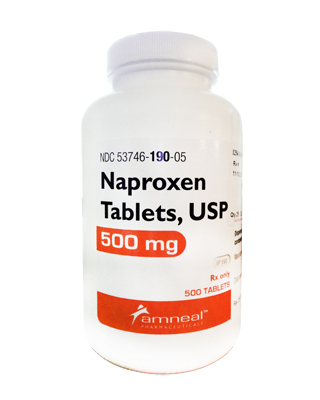 Naproxen is a Generic name for the drug containing naproxen sodium as an active ingredient. This is nonsteroidal anti-inflammatory drug (NSAID) which is used as a pain reliever for various conditions such as: headaches, dental pain, muscle pain, tendinitis (inflammation or irritation of a tendon, a thick cord that attaches bone to muscle), menstrual cramps, and for the treatment of pain, swelling and joint stiffness caused by arthritis, osteoarthritis, juvenile arthritis, bursitis, ankylosing spondylitis and gout. This drug can also be used to temporarily reduce fever and for the treatment of common cold. Naproxen products on the market are: Naproxen capsule, Naproxen tablet, Naproxen All Day Relief for Pain, Naproxen Liquid Gels, Naproxen Caplets All Day Relief for Pain, Naproxen Menstrual Pain Relief and Naproxen Sodium (nsaid) Fever Reducer / Pain Reliever. Other Brand names for medications containing naproxen are: Anaprox, EC-Naprosyn, Flanax Pain Reliever, Leader Naproxen Sodium, Midol Extended Relief, Naprelan 375, Naprosyn. 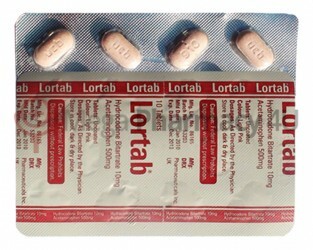 Lortab is a Brand name for a drug containing combination of hydrocodone and acetaminophen as active ingredients. Both drugs work as pain killers. Hydrocodone is potent opioid pain (narcotic) medicine while Acetaminophen is a less potent analgesic that can increase the effects of Hydrocodone. Lortab is used for the treatment of moderate to severe pain. Lortab is available in tablet form in following strengths: 5 mg/325 mg, 7.5/325 mg and 10/325 mg. Dosage is adjusted according to the severity of the pain and patient response. Tolerance to hydrocodone can be developed with continued use of Lortab and incidence of untoward effects is dose related. Other Brand names for medications containing combination of hydrocodone and acetaminophen are: Lorcet, Hycet, Lortab, Verdrocet, Vicodin, Lortab Elixir, Norco, Xodol, and Zolvit. Naproxen inhibits synthesis of prostaglandins (substances in the body that play a key role in pain and inflammation processes in body tissues) by inhibiting at least 2 cyclooxygenase (COX) isoenzymes, COX-1 and COX-2. COX-1-dependent prostaglandins play a crucial homeostatic role in physiological functions (gastrointestinal cytoprotection, aggregation of platelets and modulation of vascular muscle tone) while COX-2-dependent prostaglandins play dominant roles in pathophysiologic processes (inflammation and cancer, or physiological processes such as endothelial vasoprotection). If NSAID drug less inhibits the COX-1, less side effect would be caused. Studies showed that naproxen has a lowest risk of provoking heart attack compared to all other NSAIDs. Hydrocodone is an opioid agonist of opioid receptors within the CNS. This morphinans structure substance blocks pain perception in the cerebral cortex of the brain. Hydrocodone decreases synaptic chemical transmission in the CNS, which in turn inhibits pain sensation into the higher centers of the brain. Agonist activities at the μ and kappa receptors can cause analgesia, miosis, and decreased body temperature. Agonist activity at the μ receptor can also cause the suppression of opiate withdrawal, while antagonist activity can result in precipitation of withdrawal. Hydrocodone acts at several locations within the CNS by involving several systems of neurotransmitters to produce analgesia, but the precise mechanism of action has not been fully understood. Opiate agonists don’t change the threshold or responsiveness of afferent nerve endings to noxious stimuli nor the conduction of impulses along peripheral nerves. Instead, they alter the perception of pain at the spinal cord and higher concentrations in the CNS and the person’s emotional response to pain. Hydrocodone can produce inhibition at the chemoreceptors through μ-opioid receptors and in the medulla through μ and δ receptors which can lead to dose-related respiratory depression. From a pharmacology standpoint, there is no harm if Naproxen is taken together with Lortab. So if Lortab isn’t controlling the pain well, patients can use Naproxen and Lortab together but only with physician instructions. Naproxen is a blood thinner and may cause bleeding in predisposed patients, so if patient is already taking Lortab for the treatment of post-surgical pain, in that case, these drugs shouldn’t be used together. There are also many other factors that can exclude the usage of Naproxen and Lortab combination such as: age, past medical history, pregnancy and breast-feeding, and possible interactions with other medications, food or alcohol. However, Naproxen is the safest NSAID for the patients with coronary disease. It has the lowest risk of provoking heart attack. The table below shows side effects after Naproxen and Lortab administration in recommendable doses. The incidence can be significantly increased if these drugs are overdosed or taken together. Patients should tell their doctor and pharmacist if they are allergic to Lortab or Naproxen, or any other medicines, or any of the ingredients that are used in Lortab or Naproxen products. Patients should tell their doctors or pharmacists what prescription and nonprescription medicines, vitamins or nutritional supplements they are taking or plan to take. Patients should also tell their doctors if they are using any of the following medications: antihistamines, dronedarone, medications for irritable bowel disease, Parkinson’s disease and ulcers, haloperidol, azithromycin, amiodarone, butorphanol, chlorpromazine; citalopram, laxatives such as lactulose, nalbuphine or pentazocine, levofloxacin. They should also tell their doctors if they are taking the following medications or have stopped taking them within the past two weeks: isocarboxazid (Marplan), selegiline (Eldepryl, Emsam, Zelapar), phenelzine (Nardil), rasagiline (Azilect), or tranylcypromine (Parnate). Doctor may need to change the doses of medicines or monitor carefully for side effects. Lortab shouldn’t be used if patient has blockage of stomach or intestines, or paralytic ileus. Patients should tell their doctor if they have or have ever had hypotension, difficulties with urinating, seizure attacks, or any of the thyroid, liver, kidney, gall bladder or pancreas disease. If patients are having surgery, including dental surgery, they should tell their doctor or dentist that they are taking Lortab. Lortab may make patients drowsy. Patients taking Lortab should not drive a car or operate machinery. Lortab may cause dizziness, fainting and lightheadedness, if patient get up too quickly from a lying position. This is more common when initial dose of Lortab is taken. To avoid this problem, patients should slowly get out of bed, resting their feet on the floor for a few minutes before standing up. Lortab can cause constipation. Patients should talk with their doctor about changing diet and using other medications to treat or prevent constipation. Pregnant patients should never use these medicines; because their babies could become drug dependent, so life-threatening withdrawal symptoms can be caused after baby is born. Those babies may need medical treatment for several weeks. Patients should tell doctor if they are pregnant or plan to become pregnant. Patients should tell their doctor if they are breastfeeding. Patients should avoid alcohol while using these medications. Drinking alcohol can increase certain side effects of Lortab and Naproxen. Alcohol may increase the risk of liver damage while taking Lortab.